Artist Nicola Anthony invites you to take part in an artwork time capsule, wherein participants write a letter to themselves. The letter will become part of a sculptural artwork at the Debut Contemporary Gallery, and in three years time your letter will be mailed back to you. Participants will thus receive a message from their past self and become a part of the artwork. Nicola Anthony is fascinated with the things often thought but less often articulated. She collects the words and secrets of others which become the source and inspiration of her work, and creates tactile artworks about language, memory, mapping, and collecting. Anyone! This should be as diverse a representation of society as possible. Where do I post or email it? Is it private or will others read it? Your letter can remain private or you can allow extracts of your words to be used in the creation of an installation in the gallery window space and the artist’s future work. NB The artist will not use participant’s name, address, or full letter. If you would like it to remain private please write private on the envelope. How & when will I get it back? Please include an address you can be reached at in 3 years time at the top of your letter (or as a return to sender on reverse), and/or an email if you are not sure, so the artist can get in touch to check your postal address. In 2014 the letters will be disassembled & posted back to each participant, who will not only receive a message from their past self but also a part of this artwork time capsule. Shall I seal it or include an envelope? See some entries and more about how it’s shaping up here. 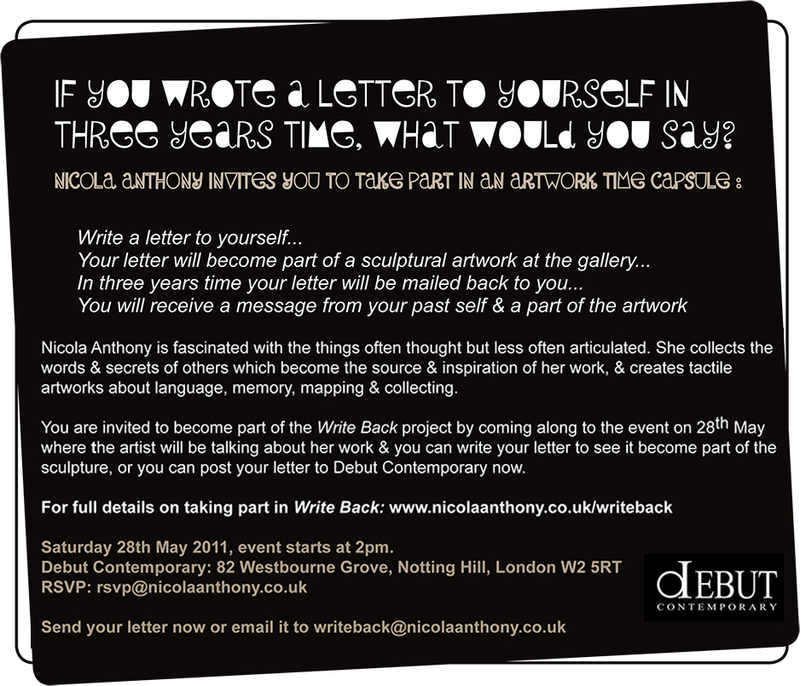 Nicola Anthony is fascinated with words and the things often thought but less often articulated. The artist’s feature piece in the gallery is a life sized replica of a postbox made entirely of laser-cut paper words and sentences. Through the collecting of words & secrets the artist gathers the source and inspiration for her artworks. Keep up to date with the letter entries on the Artist’s blog.